We are pleased to announce the addition of "Jackie Coogan" to our exciting group of dolls based on classic Hollywood Legends. Jackie Coogan (1914-1984) was an American actor and comedian who began his movie career as a child actor in silent films. Charlie Chaplin's film classic The Kid (1921) made him one of the first child stars in film history. The 1921 silent film is Chaplin's first feature-length film and an acknowledged masterpiece. Faithfully based on the beloved character in the title, "The Kid" stands 11 inches tall and is fully jointed at the neck, shoulders, hips, and knees with the RJW wooden ball & socket jointing system. He has a realistic molded felt torso and limbs and hands with individually sewn fingers. The molded felt character face has been finely modeled in a true likeness with delicate hand painted features, and the wig is styled of the finest imported mohair. Extensively researched for the utmost in authenticity, the Kid's period costume includes a cotton ribbed sweater, twill trousers with braces (suspenders), cotton socks, leather boots, and a wool tweed 'newsboy' cap. The deliberately oversized costume has been artistically distressed and aged with frayed edges, stains, holes and tears. No detail has been overlooked to bring this legendary film character vividly to life..
Jackie Coogan in 'The Kid' is produced in a limited edition of 100 pieces worldwide. The 'RJW' brass button is affixed to each piece as a lasting mark of identification and a signed and numbered certificate of authenticity is included inside the deluxe presentation box. R. John Wright is pleased to announce the addition of "Charlie Chaplin™" to their exciting group of dolls based on the classic Stars of Old Hollywood. Charlie Chaplin (1889-1977) was an English comic actor, filmmaker, and composer who rose to fame in the era of silent film. Chaplin became a worldwide sensation through his screen persona "The Little Tramp" and is considered one of the most important figures in the history of the cinema. A DOG'S LIFE is a 1918 American short silent film written, produced, directed and starring Charlie Chaplin. Long hailed as one of Chaplin's finest short comedies, the story presents the misadventures of a homeless man - Chaplin's iconic Little Tramp character - and a stray dog, 'Scraps', as they struggle to survive in the big city. To mark this year's 100th anniversary of the release of the film, we are proud to introduce Charlie Chaplin - brought to life for the first time in the medium of molded felt! Faithfully based on the beloved "Little Tramp" character in the 1918 silent film, A Dog's Life, Charlie stands 17 inches tall and is fully jointed at the neck, shoulders, elbows, hips, knees and ankles, with the RJW wooden ball & socket jointing system. He has a realistic molded felt torso and limbs and hands with individually sewn fingers. The molded felt character face has been finely modeled in a true likeness with delicate hand painted features, and the wig is styled of the finest imported mohair. Extensively researched for the utmost in authenticity, Chaplin's iconic "Little Tramp" costume includes one-piece period underwear, a short-sleeved muslin shirt and a detailed waistcoat made out of distinctive plaid fabric. The oversized trousers are made of custom-dyed corded twill fabric and are held up with detailed suspenders w/leather tabs. The fully-lined coat is tailored of fine worsted wool with a subtle black-on-black stripe and working pockets. The entire costume has been artistically distressed and aged with frayed edges, stains and tears. Charlie's trademark bowler hat is made of all-wool felt and his hand-cobbled leather boots include custom-made miniature shoelaces! No detail has been overlooked to bring this legendary film character vividly to life. 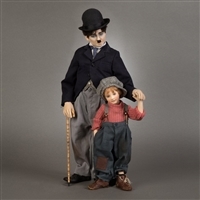 Charlie Chaplin in 'The Kid' stands 17 inches tall in perfect proportion to Jackie Coogan. He is fully jointed at the neck, shoulders, elbows, hips, knees and ankles. He has a realistic molded felt torso and limbs and hands with individually sewn fingers. The molded felt character face has been finely modeled and hand painted. The wig is styled of the finest imported mohair. Extensively researched for the utmost in authenticity, Chaplin's costume from 'The Kid' includes a short-sleeved shirt with a starched collar and miniature tie. The detailed waistcoat features a distinctive plaid fabric with cotton trim. The oversized trousers are made of custom-dyed corded twill fabric and are held up with detailed suspenders w/leather tabs. The fully-lined coat is tailored of fine worsted wool with working pockets. The entire costume has been artistically distressed and aged with frayed edges, stains, holes and tears. Charlie's trademark bowler hat is made of all-wool felt and his hand-cobbled leather boots include patches and custom-made miniature shoelaces! As a final perfect accessory, Charlie holds his trademark bamboo cane hand crafted at the RJW workshop out of wood with hand painted detail. Matching numbers are provided subject to availability.